Today we have a guest article by Jan Botthof, a PhD Student at the Cambridge University Department of Haematology and the world renowned Wellcome Trust Sanger Institute. Together with the EMBL-European Bioinformatics Institute – with which it shares the Genome Campus a few miles south of Cambridge – the Sanger Institutes is one of the World’s top centres of expertise for genome research. As EMBL-EBI’s associate director Ewan Birney highlighted in a recent article for the MRC Insight blog, by studying the biology of a wide variety of model organisms – including humans and zebrafish among many others – the more than one thousand scientists working on the Genome Campus a gaining critical insights into biology that are advancing 21st century medical science. When most people think of animal research, they imagine mice, rats or maybe fruit flies. However, other models are increasingly being used in addition to the more traditional organisms. The number of zebrafish (Danio rerio) in particular is steadily increasing in biomedical research each year. You might be wondering why scientists are using fish instead of animals more closely related to humans for their studies. Let’s have a look at some of the advantages of the zebrafish to explain this matter. This list is obviously not going to be comprehensive, because many advantages are field-specific and quite technical, but it should give you an idea why researchers might want to choose fish over other animals. The zebrafish, a rising star star of medical research. First of all is something that makes zebrafish more attractive to scientists who pressed for time, such as PhD students wanting to graduate punctually (like me! ): zebrafish reproduce at a rapid rate. Each female can lay several hundred eggs each week, which will develop into mature adults in about three months. This is especially useful if you need to breed a large number of animals very quickly, or when you want to cross several lines with modified genes. Rapid breeding also greatly reduces the time it takes to introduce novel genetic modifications into the animals, as several generations are required before a stable modification of the gene in question is achieved. This makes zebrafish a very efficient species for research. Another really useful trait of zebrafish is that their embryos are relatively large and initially transparent. This makes it easy to manipulate the embryo, which is very helpful if you are injecting various substances to modify their properties. In my case, I’m using a technique called CRISPR-Cas9 to very precisely switch off certain genes, but there are many other applications. An added advantage is that you can treat these embryos chemically to stop pigmentation from forming, making it very easy to study early embryonic development (Figure 1). Moreover, the embryos are permeable to many chemicals and drugs – making them ideal for screening large numbers of toxicology samples or drug candidates. The zebrafish genome has been fully sequenced, which is a must-have for model organisms nowadays. This effort showed that their genome is remarkably similar to the human one, with at least 70% of human genes having a zebrafish equivalent – a figure that is even higher when only disease-causing genes are considered. There are also efforts underway (by the same group that sequenced the zebrafish genome, which coincidentally happens to be right next to my research group) to mutate every single gene in the zebrafish genome. This can be very helpful if you study a certain gene and wonder what happens to the whole organism when it is lost – and having such large scale resources can save the wider research community huge amounts of time and effort. Apart from fish with mutations in specific genes, there are also numerous lines containing genes from other organisms (transgenic lines). Usually the proteins encoded by these genes are fluorescent and are used to mark specific cells, as we can control (at least partially) in which tissue a protein is made. One of these is called green fluorescent protein or GFP (originally from a jellyfish). Using techniques such as GFP it is possible to visualize changes in specific cell populations in real time in living animals. Just to give you a personal example: I study blood development, so naturally I want to look at the different types of blood cells. Depending on what cell type I want to look at, I can select an appropriate zebra fish line, where this type is labelled. For an example, have a look at Figure 2, which shows early blood cells during embryonic development labelled with GFP. As these fluorescent proteins come in different colours, it’s possible to look at two or more different cell types at the same time. A recent advance is the generation of fully transparent adult zebrafish, aptly named “Casper” after the popular cartoon ghost. You can look up the freely available original paper here if you want to see what these fish look like. Of course, scientists are not making transparent fish just because they look cool, but they are very useful tools for research. One application is the easy study of tumour metastases, as the cancer cells are just much easier to spot in transparent fish. Adding fluorescent labelling as described above can make this technique even more powerful. Usually when we use zebrafish, we take advantage of the fact that many fundamental processes have been evolutionary conserved between fish and humans. Because of these similarities, we can use zebrafish as a model for what happens in humans. Sometimes differences between animals and humans can be more telling though. For example, many animals can regenerate much more efficiently than humans (you might have heard about the ability of salamanders to regrow lost limbs or tails) and this is also true to some extent for zebrafish. One very well studied research area is heart regeneration. Humans are unable to regenerate heart muscle tissue, which is of course problematic when parts of it die off during a heart attack or following injury. 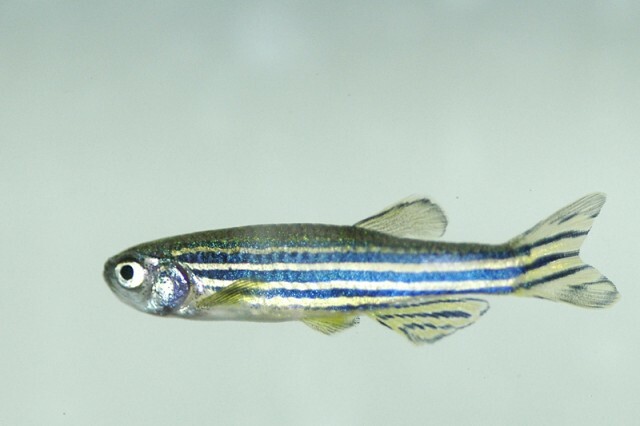 In contrast, zebrafish can use stem cells to regenerate the lost tissue – if we could induce a similar process in humans, it might help treating people recovering from cardiac injury. The British Heart Foundation is funding important research in this particular field through its “Mending Broken Hearts” campaign. In the even longer term, it might be possible to adapt similar principles to other tissues and thereby help in treating a variety of injuries. The regenerative capacity of zebrafish isn’t only interesting for medical research, but it has a very practical advantage: you can cut a tiny part of the tail fin off and use it to extract DNA from the tissue. Then, the mutation status of a specific gene can be determined, which is essential when you want to know whether an animal is a carrier for the mutation you are interested in. The fin then grows back within two weeks, so the animal is not harmed. Lastly, I just want to mention some financial considerations. Animal research in general is really expensive, which is one of the reasons why alternatives are used whenever possible. These costs are largely determined by how much effort and space is required to house, feed and care for the animals. Of course, this makes large or exotic species especially expensive, so they are used less often. However, even rodent colonies can cost quite a lot of money to maintain. Zebrafish require much less space per individual, are relatively inexpensive to feed , and it’s also relatively straightforward to ship animals (usually as embryos) between labs. This facilitates collaborative research and reduces the number that need to be used, since they don’t have to recreate the same genetically modified line all over again. In conclusion, zebrafish have a lot of useful characteristics that make them very practical and useful model organisms, which explains their rising popularity among researchers. In the next article of this series, I’m going to have a closer look at zebrafish care, as well as daily work in a fish facility and some of the rules and regulations surrounding fish welfare. Posted on May 11, 2015 May 11, 2015 by EditorPosted in News, Science NewsTagged animal research, British Heart Foundation, CRISPR, genome, medical research, Wellcome Trust Sanger Institute, zebra fish, zebrafish.